Easter is on the way – and that tends to mean chocolate. Easter eggs have been with us since the early 19th century, building on Christian and Pagan narratives around death and resurrection. Chocolate is big business, and not just at Easter. The average UK citizen spends £75.25 a year on it, with the chocolate confectionery sector worth £5,039m overall. 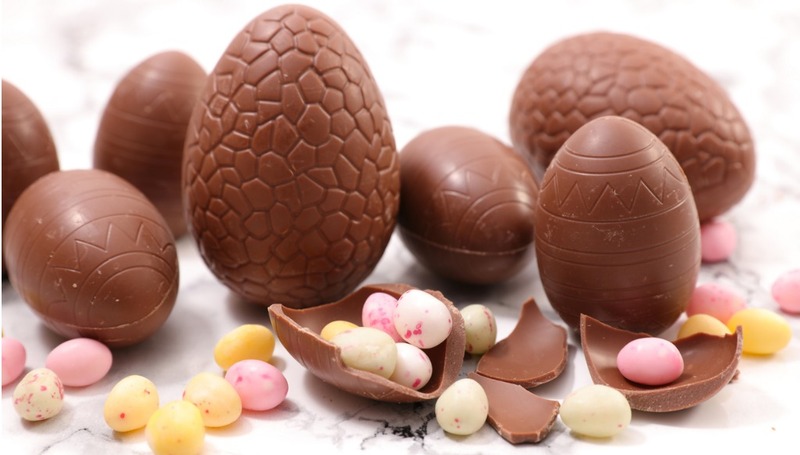 Holiday-themed goodies are on the rise worldwide, with rises in Easter chocolate production of just under 25% in recent years. Striking figures for sure, but also worthy of note is the amount of energy and raw materials that go into getting cocoa from the plant to perfectly packaged sugary delicacy – and the climate impact those processes bring. A 2018 study found that in the UK, the chocolate industry is responsible for two million metric tons of carbon dioxide (CO2) emissions. That shouldn’t come as a surprise if you consider the cocoa, milk, manufacturing and shipping involved. The same study also suggests that dark chocolate is a better option than milk if you’re considering carbon footprint alongside your sweet tooth. The impact of climate change tends to be most keenly felt in the same areas as where chocolate is farmed – Central and West Africa, Asia and Latin America. The cocoa industry has also been associated with deforestation and child labour. It begs the question as to whether chocolate can ever be considered an ethical choice. One measure we can all take is to look out for appropriate certification. The Rainforest Alliance certification scheme aims to ensure that forest is not cleared for unsustainable plantations, in addition to delivering better soil quality. Together with the Sustainable Agriculture Network, it encourages measures such as the safe use of chemicals, retaining shade trees and creating buffers for water bodies. Such moves are designed to not just be better for the environment and human welfare but produce greater yields to boot. There are now hundreds of thousands of farms carrying the green frog logo, with studies showing that the measures can result in these desired positive results. Fairtrade is a more widely-known certification scheme, which is all about making sure that producers are given their share of proceeds of a growing industry. The Fairtrade Premium, a sum beyond usual Fairtrade rates which is used to reinvest in these primary agricultural businesses, can contribute to greater environmental standards through farmers being able to put money into improved infrastructure. Cocoa sourcing and energy supply for the manufacturing process have been identified as the ‘environmental hotspots’ of chocolate’s production cycle. In an attempt to change this, Carbon Trust has a guide for food and drink manufacturers to become more energy efficient, with advice on motors and drives, process management, refrigeration and more. The opportunity for increased profit margins may prove at least as much of a driver to change on the factory floor as the chance to reduce CO2 emissions. While the manufacturing of chocolate products is the most energy-intensive part of the route from plant to plate, we cannot discount how chocolate is moved around during its production process. Transporting chocolate in highly-packaged, air-filled egg form is not the most efficient form of delivery. After all, you don’t get much chocolate in a truck. Bars are better – IKEA has decided to take this logic to a natural conclusion with the creation of a flat pack chocolate Easter bunny. At a recent Energy Saving Trust supported event aimed at improving sustainability in the freight and logistics sector, Unilever and Mars both expressed serious interest reducing their supply chain emissions. Such companies increasingly want their logistics service providers to calculate emissions in the same way, which should enable them to choose more sustainable options easier. Outbound - moving around the finished product. It is possible to measure the carbon impact of both inbound and outbound logistics in a harmonised way; bringing together the energy used in a truck or ship, the number of tonnes moved and how far, to come up with a CO2/tonne-km figure. The Global Logistics Emissions Council is currently trying to help the big players in the market to move towards such harmonisation. Is eggcellence ahead for a changing industry? An assessment of the sustainability of chocolate isn’t entirely straightforward, with a number of moving parts and the techniques to bring these impacts into a single measurement haven’t quite caught up. But there seems to be a growing will to change the industry, alongside growing innovation. Take the recent developments, with Nestle using biogas derived from waste chocolate to generate electricity and Ritter Sport investing in a combined heat and power plant and energy management technology. Then there’s the enduring idea of manipulating the unwanted products of chocolate-making processes into automotive fuel. In a sense, chocolate’s enduring high profile – particularly around holiday seasons – means the industry has nowhere to hide poor practice. Improved sustainability credentials would add even more pleasure to the chocolate experience. Climate change: what can you do to help?